After furious development efforts proved essentially fruitless over the past year and a half, Ducati finally seems to be solving the principal bugaboo with the handling of its MotoGP bike, i.e., lack of front end grip and feel. Valentino Rossi debuted the new chassis with a second place at Missano last weekend, while Nicky Hayden soldiered to seventh place with an extremely sore wrist and the old chassis. Ben Spies has confirmed his move to the Pramac Racing Ducati team next year along with Moto2 rider Andrea Ianonne. This team will have full factory bikes, and represents a reflection of Ducati’s commitment to push forward in the post-Rossi era, undoubtedly with some financial support from new parent company Audi. Don’t count Ducati out in 2013. The problem for Ducati was that during the sale to Audi, they were restricted from spending $$$ on development, now that the sale is done they are. That was a lost of an entire season. Honda and Yamaha provided Rossi with tons of bike upgrades to improve the bike where Ducati did not. Don’t forget: Rossi tested there recently so he had a good setting going into the weekend, clearly an advantage on the other guys. Mix in the terrible weather and it’s even more of an advantage because the rest of the paddock pretty much couldn’t work on their setup all weekend. I’m not dogging Rossi or taking away from his podium (good work!) but I think both of those advantages should put things in perspective. I’m very interested to see how he’s going to do at Aragon. And even if he does have a great finish, I’m still convinced his move to Yamaha makes sense this late in his career. But that chassis might be a good benefit for our American boys, Hayden and Spies! I’m a ducatista and Valentino fan, so I’m happy for both with this second place, but I feel very angry for the same thing: almost two years to produce (as it seems) a valid chassis with the right input from the rear wheeel ? ?, and it came when valentino is just leaving !!! in the past 2 years, neither honda nor yamaha were put up for sale to the highest bidder. It’s nice to see Rossi on the podium again, but I get the feeling both Pedrosa (if he hadn’t crashed) and Lorenzo (if he weren’t on cruise control) could have put 20 seconds on him. now that’s a BOLD statement. Man has that been a long time coming. 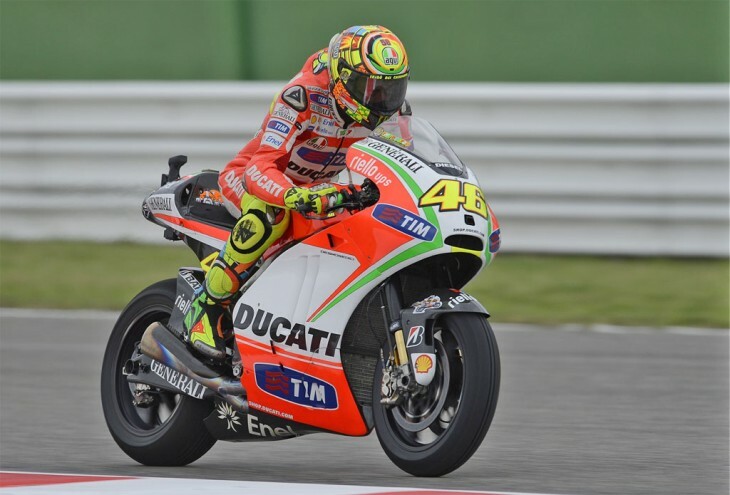 Hopefully Rossi can do something with the new frame prior to switching bikes, I’d love to see him win on a Ducati. Could be good for Cal and Ben next year. Cal Crutchlow? He won’t be on a Ducati next year. He is staying with the Tech 3 team. That’ll be great to see my two favorite riders maybe get some results. Now maybe Aprillia, Suzuki and Kawasaki can come onboard. I can’t believe I got a recaptcha that’s readable the first time! Maybe Ducati and Motorcycle Daily are coming around. That would be some serious irony if rider X on a Ducati finishes ahead of Rossi next year! It was great to see “old man” Rossi fight for and take second. Even if Pedrosa and Stoner had been there Rossi should have finished 4th, way better than his earlier dry weather finishes. Cheers to Ducati for (FINALLY) getting a workable chassis on the Desmo 16.